Duchenne muscular dystrophy (DMD) is an X-linked recessive disorder caused by truncating mutations in the DMD gene. These result in the absence of the muscle fibre stabilizing dystrophin protein and progressive loss of muscle tissue and function. 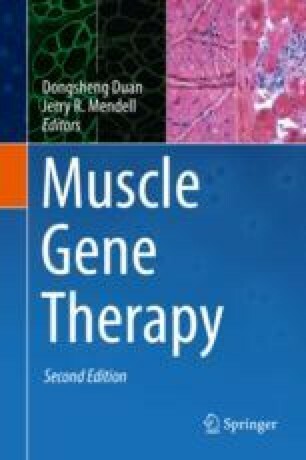 In-frame mutations with partially functional dystrophin generally lead to Becker muscular dystrophy (BMD) with a milder disease phenotype. This was the inspiration for the antisense-mediated exon-skipping approach that restores the dystrophin reading frame to allow production of a Becker-type dystrophin. This approach is mutation specific. Since exon 51 skipping is applicable to the largest group of DMD patients, two antisense compounds targeting exon 51 were developed first, i.e. drisapersen and eteplirsen. Ten years have passed since the first exon-skipping antisense compound was tested clinically in DMD patients. If objectively evaluated, initial trials were suboptimal with modest clinical success. Major hurdles were that, at the time of trial planning, natural history data and reliable outcome measures to detect clinical benefit were not available. Moreover, the levels of dystrophin that are restored in DMD patients are lower than those observed in BMD patients. This chapter looks back at the lessons that were learned during the development of DMD exon skipping so far, to allow for more optimal exon-skipping trials in the future.